Eicosapentaenoic acid (EPA) and docosahexaenoic acid (DHA) are the superstars of the essential fatty acid world, and are found primarily in fish and seafood. A tremendous amount of research has investigated the impact of these fatty acids on health and exercise performance. They have been previously discussed in ERD #12 for their potential beneficial role in increasing strength and muscle protein synthesis. Less researched is arachidonic acid (ARA, depicted in Figure 1), the omega-6 cousin to EPA that the body synthesizes from linoleic acid, the plant-based omega-6 found in nuts, seeds, and their oils. It can also be obtained in the diet from meat and eggs, albeit in small amounts. Despite its lesser-known presence in the nutrition world, ARA is an incredibly important and prominent fatty acid in cell membranes. It is found at a level comparable to that of DHA in neural membranes, including in the brain, where it comprises 10-12% of total fatty acids. In skeletal muscle, ARA has been found to make up 15-17% of total fatty acids. The body relies on ARA for inflammation, a normal and necessary immune response to repair damaged tissue. Specifically, ARA is the precursor to various leukotrienes, prostaglandins, and thromboxanes, collectively known as eicosanoids. While the majority of ARA-derived eicosanoids act to promote inflammation, some also act to resolve it (i.e., are anti-inflammatory). Scientists hypothesize that ARA plays a central role in the adaptive response to strength training. After all, strength training causes an acute inflammatory response that’s necessary to build bigger muscles. For instance, two prostaglandins produced from ARA are PGE2 and PGF2α. Test tube studies performed with skeletal muscle fibers indicate that PGE2 increases protein breakdown while PGF2α stimulates protein synthesis. Other test tube studies have also found PGF2α to increase skeletal muscle fiber growth. In support of these test tube findings, research in young adults has shown that consuming non-steroidal anti-inflammatory drugs (NSAIDs) after exercise blunts the normal increase in muscle protein synthesis through suppressing the normal increase in PGF2α. 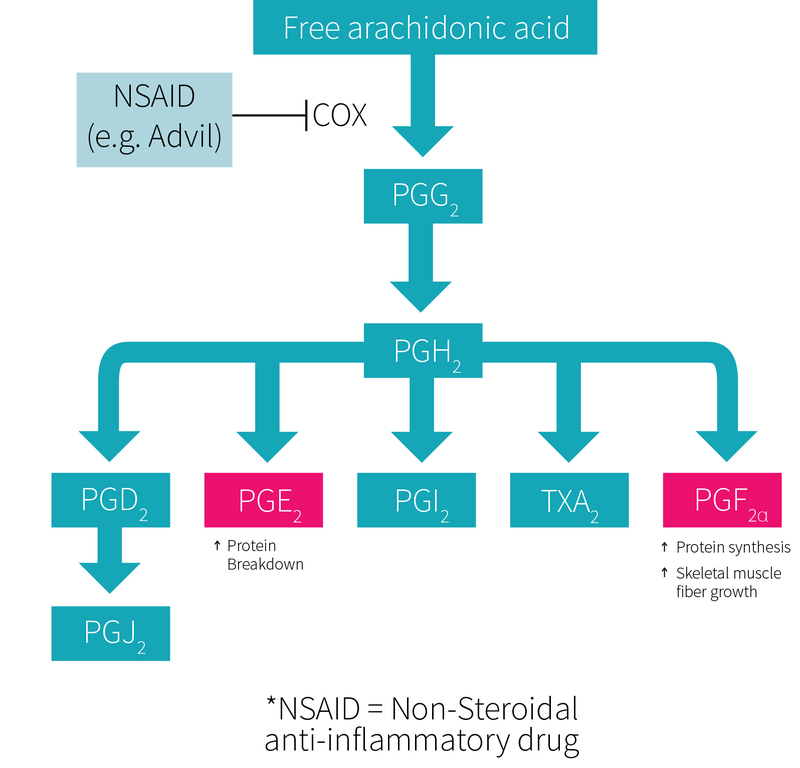 In contrast, administration of NSAIDs to older adults has been shown to enhance strength and size gains in response to resistance training by suppressing other forms of inflammation in addition to the beneficial PGF2α. Regardless of outcome, this research does clearly indicate a role of ARA-derived prostaglandins in the adaptive response to exercise. If blunting ARA-derived prostaglandin formation attenuates adaptations to resistance training in young adults, then perhaps the reverse is also true (as shown in Figure 2)—that increasing prostaglandin formation enhances adaptations to resistance training. Supplementation with ARA increases the ARA content of serum phospholipids. This increased availability is associated with increased prostaglandin formation. Accordingly, the current study was designed to examine whether ARA supplementation affected body composition and muscle function in strength-training individuals. This study also used rats to evaluate the effect of ARA supplementation on anabolic signaling mechanisms. 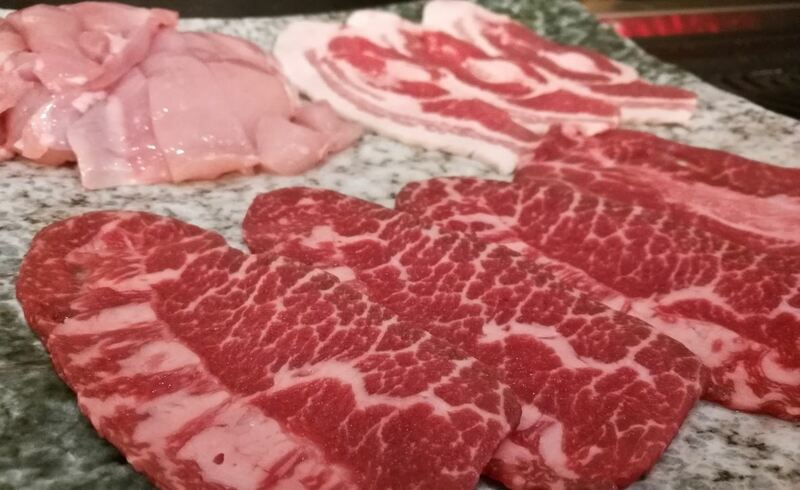 Arachidonic acid is an omega-6 polyunsaturated fatty acid synthesized in the body from linoleic acid and consumed in the diet from meat and eggs. The body relies on ARA to promote and help resolve inflammation, and some research suggests that blunting ARA-derived inflammation may attenuate skeletal muscle adaptation to resistance training in young adults. This study sought to test the opposite—whether ARA supplementation would enhance adaptations to resistance training. This study included two phases. Phase 1 is shown in Figure 3. It constituted an eight-week, double-blind, randomized, placebo-controlled trial involving 30 healthy, young males with a minimum of two years of strength training experience. Each participant was randomly assigned to consume two soft gels containing 1.5 grams total of ARA or placebo (corn oil). Instructions were given to maintain usual dietary habits and consume the soft gels about 45 minutes before training sessions, or whenever convenient on non-training days. Compliance via pill count was above 99% in both groups. The supervised strength training program was performed three times per week on alternating days. Monday was lower body (leg press, leg extension, leg curls, and hyperextensions), Wednesday was back and biceps (bent over rows, lat pulldown, and barbell curls), and Friday was chest, shoulders, and triceps (bench press, military press, skull crushers, and barbell shrugs). Each exercise was performed for four sets of eight to 12 repetitions, and the weight was increased when a given weight could be lifted 8-12 times for all four sets with proper form. Participants were allowed to rest for two minutes between sets and three minutes between exercises. Repetitions were performed with a 3:1 concentric to eccentric tempo. Before and about 48 hours after the last training session, participants were assessed for body composition via DXA scan, muscle thickness of the vastus lateralis (a muscle of the quadriceps), muscle strength (one rep-max bench press and leg press), and muscle power (cycle ergometer Wingate test). Phase 2 of this study was an eight-day experiment involving rats who were fed once daily with either 1.2 milliliters of tap water or 44 milligrams of ARA dissolved in 1 milliliter of tap water. This dose of ARA is roughly equal to that used in phase 1 based on species conversion calculations. After eight days, the rats were subjected to electrical stimulation of one of their hind legs in order to mimic an acute strength-training stimulus (the other leg served as a control). Therefore, there were four groups: exercise or no exercise, plus either ARA or placebo. Anabolic and inflammatory signaling of the hind leg muscle tissue was analyzed three hours following exercise stimulation. Partial funding for this study came from Molecular Nutrition, a company that holds the patent for and currently markets the ARA supplement used in the study, called X-Factor Advanced. Resistance-trained males underwent an eight-week resistance training program while supplementing 1.5 grams per day of ARA or corn oil placebo. Body composition, muscle strength, and muscle power were assessed before and after the intervention. Additionally, rats were fed either plain water or ARA dissolved in water for eight days, and then had their right hind leg subjected to electrical stimulation to mimic strength training. After that, muscle tissue from both legs was analyzed for anabolic and inflammatory signals. Lean body mass significantly increased in the ARA group only (+1.6 kilograms; 3%), with almost no change in the placebo group. Similarly, while both groups significantly increased muscle thickness compared to baseline, the increase was marginally greater in the ARA group (8% vs. 4% increase; p=0.08). Neither group showed a significant change or difference from one another in fat mass. Leg press 1RM was significantly increased in both groups without significant difference between them. In contrast, bench press 1RM (+8.7%), Wingate peak power (+12.7%), and average peak power (+13.2%) significantly increased in the ARA group only, leading to a significant difference in performance compared to the placebo group, which experienced no significant changes. When bench press and leg press 1RMs were combined to represent total-body strength, only the ARA group showed a significant increase. The rat experiment revealed numerous significant changes from baseline in anabolic and catabolic signaling pathways, muscle protein synthesis, inflammatory gene expression, and muscle tissue gene expression. However, only two of these were significantly different between the ARA and control groups. The first was a significantly greater reduction in AMPK activation when ARA was combined with exercise as compared to the other three groups. The second was a significantly greater activation of GSK-3β (glycogen synthase kinase 3 beta) in the non-exercised leg ARA group, as well as a significantly greater reduction in GSK-3β after exercise. ARA supplementation led to significantly greater increases in lean body mass, bench press 1RM, and power output than placebo. The rat experiment showed that ARA led to a significant reduction in AMPK and GSK-3β activation when ARA was combined with exercise as compared to the other groups. Other markers of anabolism and catabolism were not affected by ARA treatment, although they were affected by exercise. The primary findings of this study were that eight weeks of ARA supplementation in combination with a resistance training program lead to significantly greater increases in lean body mass, bench press strength, and muscle power output than placebo in young, strength-trained men. These findings are somewhat in contrast to previous research. 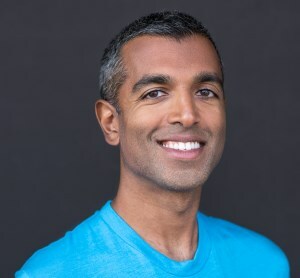 The only other study to date investigating the effect of ARA supplementation on resistance-trained young men found that consuming one gram per day of ARA significantly increased Wingate peak power output by about 13% compared to placebo, but had no effect on changes in body composition or strength. There are important methodological differences between this and the current study that may explain why no effect on strength and body composition was observed. Both studies recruited young men with strength training experience and had them undergo a resistance training program while supplementing ARA or placebo for about eight weeks. However, the dose in the current study was 1.5 grams per day compared to one gram per day in the previous research. 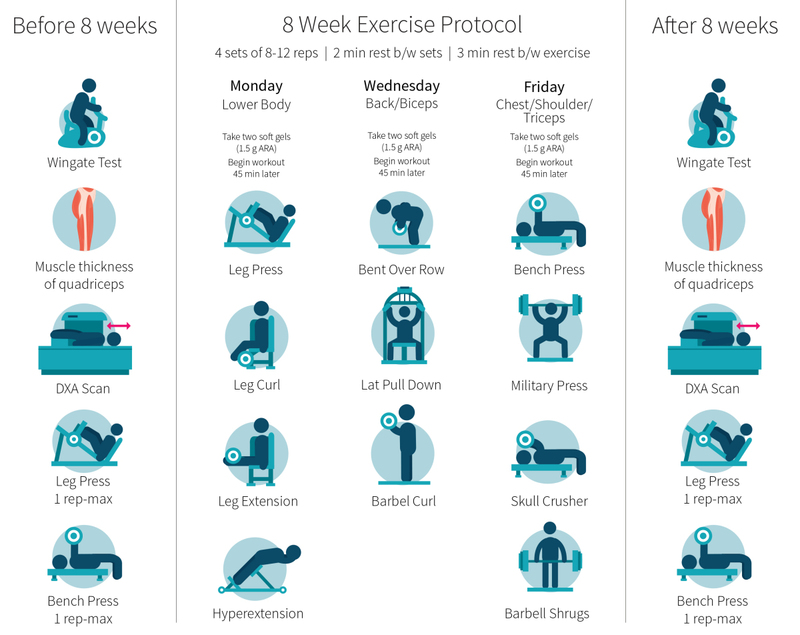 Additionally, the previous study used a split-body linear periodization routine performed four days per week, which meant that each major muscle group was being trained more frequently (twice vs. once per week) with greater volume (six vs. four total weekly sets). Finally, the previous study used food logs to ensure that the participants were consuming at least two grams per kilogram bodyweight of protein daily, whereas the current study did not control for or monitor dietary intake. It is difficult to conclude that ARA has beneficial effects on body composition and strength in light of the conflicting evidence between these two studies. What was the rationale for the resistance training program used in this study, as opposed to the previous study? And why would this study not ensure adequate protein intake, or at the very least monitor dietary intake? Although the fact that Molecular Nutrition funded both studies doesn’t at all invalidate the results, it’s possible for a follow-up study to have a slightly different study design and thus have increased chances of finding a significant. The first study didn’t show as promising results, and unfortunately it isn’t known which study characteristics might affect the eventual outcomes. Of note, the authors of the current study note in their discussion that “the training in the current study was intentionally stagnated (e.g. non-periodized regimen) in order to induce a training plateau in those strength-trained males.” Additionally, it’s widely agreed upon that a protein intake of 1.2-2.2 g/kg bodyweight is necessary to allow adaptation to training for individuals at or above their energy needs (Phillips et al; Tarnopolsky; Phillips & Van Loon; ISSN & ACSM position stands). However, requirements may increase to 2-3 g/kg to offset the loss of muscle mass when the athlete is in a caloric deficit. Without controlling for dietary intake, we have no idea what the protein requirements to optimize muscle growth were for the participants, and the possibility remains that dietary differences in both protein and calories had an effect on the increased LBM with ARA supplementation. Future research will be needed to investigate if 1.5 grams per day of ARA also has benefit when the participants are known to be consuming adequate protein and undergoing a periodized resistance training program designed to promote muscle growth. Muscle power output appeared to benefit from ARA supplementation in the current and previous research. The mechanism for this finding remains to be determined. It is possible that ARA modulates neuromuscular signaling through its incorporation into cell membranes, similar to EPA and DHA as discussed in ERD #12. At least one study supports the notion that ARA increases neurotransmitter firing from nerve cells. More research investigating why ARA supplementation increases muscle power output is warranted. The rat experiment found largely null findings with regard to the effects of ARA supplementation on anabolic and catabolic signaling pathways, muscle protein synthesis, inflammatory gene expression, and muscle tissue gene expression. Additionally, the previously mentioned trial found no significant effect of ARA supplementation on muscle protein content or gene expression, supporting the findings of the current study. Nonetheless, a significant baseline elevation was observed in GSK-3β with ARA supplementation. GSK-3β was originally named for its ability to inhibit glycogen synthesis and regulate glucose metabolism, but recent evidence suggests it also plays an important role in cell signaling, cell division and growth, and cell death. How ARA increased GSK-3β remains to be determined, as do the short- and long-term consequences of such an elevation. Notably, some evidence has found elevated GSK-3β in the skeletal muscle of persons with type-2 diabetes and insulin resistance. Similarly, selective inhibition of GSK-3β improves insulin action and glucose uptake into skeletal muscle tissue. ARA supplementation also significantly reduced AMPK activation when combined with exercise. It is well-known that AMPK activates in response to a deprivation of cellular energy, leading to, among other things, a reduction in protein synthesis and inhibition of the anabolic mTOR pathway. Again, the implications of this finding remain unknown, although it is plausible that this played a role in the significantly greater lean body mass observed with ARA supplementation. Still, there were no significant differences in other anabolic signaling pathways. This study tells us that young men with resistance training experience may benefit from ARA supplementation through increased lean body mass, muscular strength, and muscular power. However, with only a single other study conducted to date investigating these outcomes with regard to ARA supplementation, drawing firm conclusions is difficult, especially because the other study found a benefit for muscular power only, and not body composition or muscular strength. It is well established that an imbalanced intake of omega-6 and omega-3 fatty acids is associated with many chronic diseases that have an underlying inflammatory component, such as obesity and cardiovascular disease. It has been estimated that humans evolved eating a diet containing a 4:1 to 1:1 ratio of omega-6 to omega-3 fatty acids. This ratio is at least 15:1 in the modern Western diet. In light of this, one could speculate how long-term supplementation of ARA may impact health outside of potential changes in body composition. According to the USDA Food Database, the richest source of ARA is boiled beef kidney, which provides 0.37 grams per 100 grams of kidney. To obtain the 1.5-gram dose of used in the study under review, one would need to eat about 400 grams or 14 ounces of boiled kidney daily. The next richest source is braised beef brisket. Yet, at 0.06 grams per 100 grams of brisket, one would need to eat 2500 grams or 5.5 pounds daily. It appears safe to say that the supplemental dose of ARA used in the current study is not realistically obtainable through the diet, something that has been touched on before when discussing animal-based trans-fat research in ERD Issue 14 and when discussing gluten research in ERD Issue 18. As mentioned previously, it has been shown that supplementation with ARA increases the ARA content of serum phospholipids and that this increased availability is associated with increased prostaglandin formation. Therefore, it stands to reason that long-term supplementation might increase inflammation in the body. Whether this would beneficial or detrimental over the long term remains to be determined. Other health effects are also unpredictable. On the one hand, supplementing with ARA could potentially have a negative effect on the brain through increasing the production of beta-amyloid, which is one of the key events that occurs in Alzheimer’s disease. On the other hand, elderly Japanese adults (56+ years) have lower concentrations of ARA in red blood cell membranes than younger adults (in their 20s) after controlling for EPA and DHA content. And supplementation with 240 milligrams of ARA daily for one month among elderly people has demonstrated efficacy for improving cognitive function while also increasing red blood cell membrane ARA content. Interestingly, elderly people who supplemented with 740 milligrams of ARA did not have increased ARA metabolites, meaning that it did not increase levels of inflammation. The dose of ARA used in the current study is well above what anyone could reasonably expect to consume naturally in the diet. Evidence linking inflammatory diseases to an increased omega-6 to omega-3 ratio raises concern over the long-term effects of ARA supplementation. However, limited evidence has shown supplementation of ARA to benefit the cognition of elderly individuals despite a hypothetical plausibility for increasing Alzheimer’s disease risk. Clearly, long-term research on different health outcomes is needed. How does regular exercise interact with ARA metabolism? Some evidence shows that the ARA content of skeletal muscle fiber membranes is similar between endurance-trained and untrained individuals, but the trained individuals have more DHA and a lower omega-6 to omega-3 ratio. Additionally, both endurance training and resistance training do not appear to significantly alter the ARA content of skeletal muscle fiber membranes, but do significantly increase DHA content. These findings give rise to more questions than they do answers. Why does exercise increase the proportion of DHA? Is this the result of increased usage of ARA, which is needed to stimulate inflammation and begin the recovery process? Or is this a protective adaptation that increases the ability to resolve inflammation through the anti-inflammatory metabolites of DHA? ARA is a fatty acid that plays a central role in both promoting and helping to resolve inflammation. The current study showed that young men supplementing with 1.5 grams of ARA daily for eight weeks experienced significantly increased lean body mass, upper-body strength, and lower-body power output when combined with non-periodized resistance training program. However, the only other study investigating similar outcomes showed no effect on body composition or strength, but did support the findings of increased power output. Accordingly, it is difficult to draw conclusions until more research is conducted.